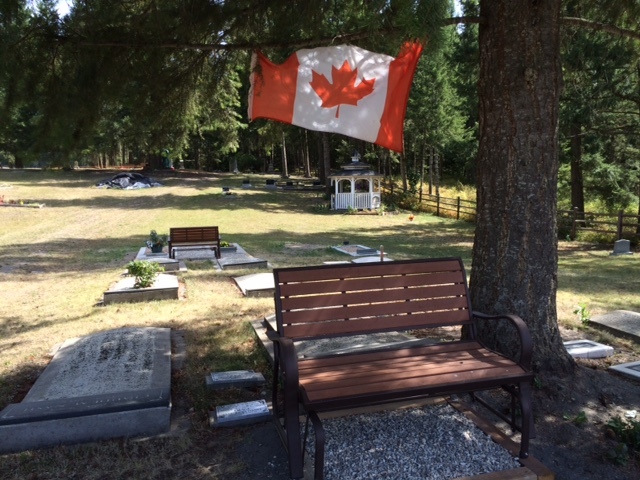 The following is a transcription of the Notch Hill Cemetery located in Sorrento, British Columbia, Canada. Latitude: 50o 51' 24.50" N.
Longitude: 119o 26' 05.97" W.
The property on which the Notch Hill Cemetery is located was part of pioneer homesteader, John McIntyre’s ¼ section. Mr. McIntyre donated approximately an acre and half, of his land, for use as a cemetery in the 1890’s. The first recorded burial is Baby Morris Burton Johnson in 1899. Historical burials in the cemetery include the Scarlett Fever epidemic that struck the area in January of 1903 resulting in the deaths of several children, two of those children, Jessie Evelyn Johnson and Maria Amanda Huhtala, are buried in the cemetery. On July 20, 1903, there was an accident at Kault when the Columbia River Logging Co. wooden trestle collapsed. Two men, Colin MacEwen and John George Russell, died in this accident. They each have tall, marble upright headstone, side by side. One interesting grave in this cemetery holds the remains of five men who died on June 22, 1909. These men, who were hitching a ride in a boxcar, died when a flange broke and the box car over turned, down an embankment. They were brought to Notch Hill Cemetery by horse and buggy and buried. They were identified as J. Moloskyi, Ilko Skaczick, Joe Kossukcivi, M.W. Gawda and H. Mavlosky. Commemorative signage was erected in the cemetery to honour these men. Notch Hill Cemetery is approximately 1.5 acres in size and enclosed with a wooden split rail fence. At the entrance, is a steel arch with the name of the cemetery at the top and two steel posts. A side passage gate to the left allows individuals to enter by foot only. There is beautiful gazebo, built by volunteer woodworker, Ejner Andreasen, located halfway up the cemetery, on the right side. 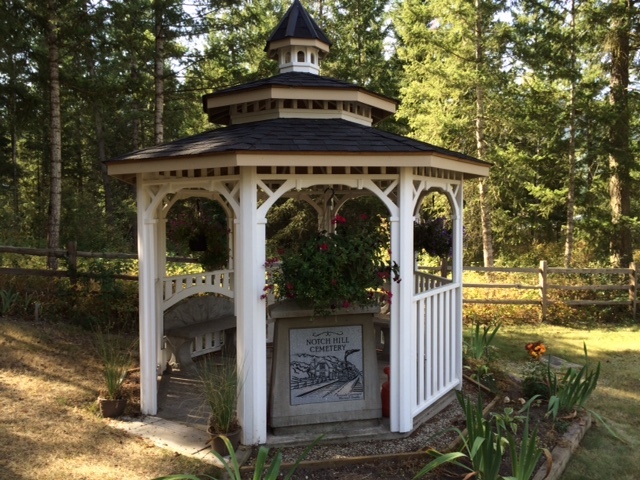 On one side of the gazebo, there is a cement monument which holds a large granite plaque; with the words: ‘Notch Hill Cemetery’ and an etching of the original Notch Hill train station that was demolished in 1968. 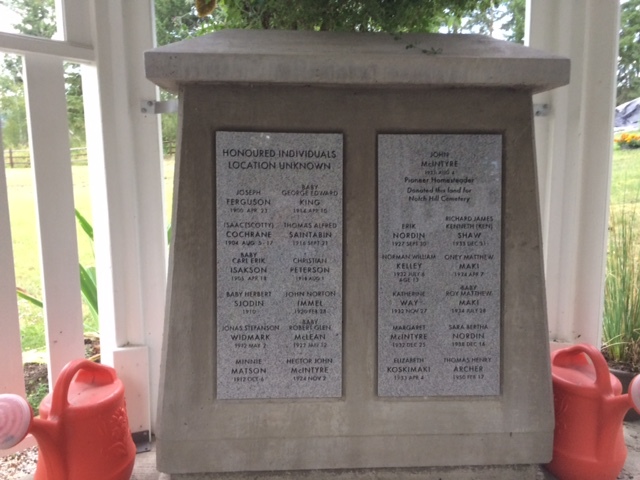 On the inside face, there are two granite plaques honoring twenty-two individuals, known to be buried in the cemetery but their exact plot location is unknown. There is a large memorial garden halfway up on the left side. 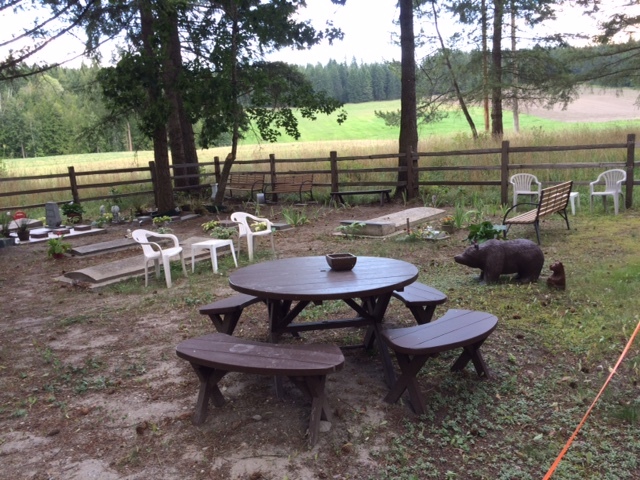 A water tank that was donated to the cemetery sits behind a large tree and gravity feed with a hose is used - to water the garden from the tank. Many benches are located throughout the cemetery and a table at the back is for use by families and friends to sit and contemplate the beautiful park-like surroundings. There is a tool shed and a cemetery office located at the back right of the cemetery. Each grave in the cemetery has a headstone. It is in the cemetery rules and regulations, that families must put a headstone on the grave of their loved one within a year of burial or cremation. 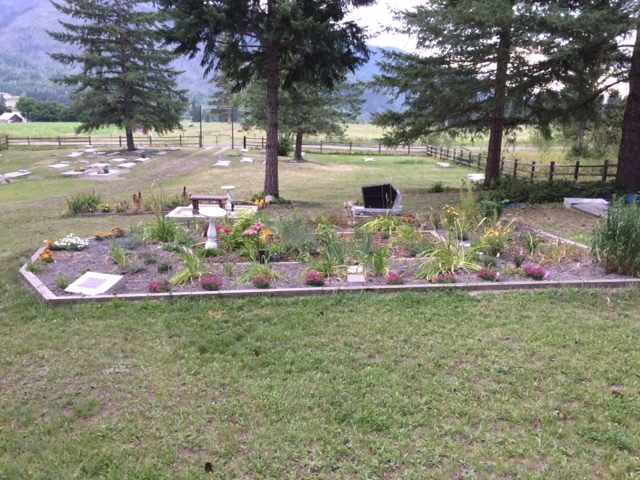 The cemetery is extremely well maintained by dedicated volunteers. 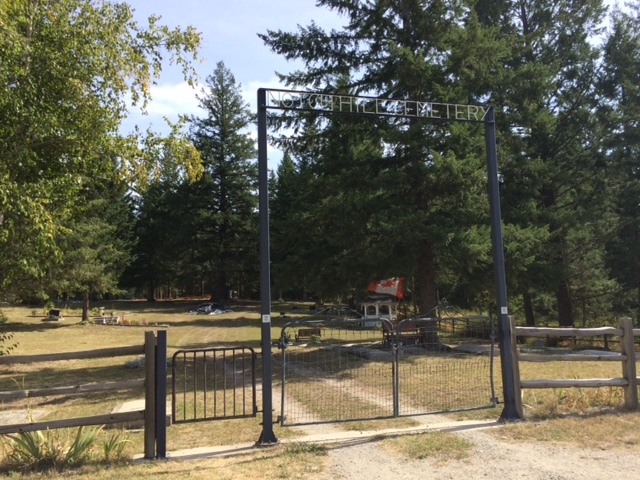 Notch Hill Cemetery is currently in use and registered with Consumer Protection BC in Victoria. The cemetery sells pre-paid cremation and burial plots according to the Notch Hill Cemetery Regulations. From the Trans-Canada Highway (Highway 1) between Sicamous (4.5 km) and Balmoral (5 km) turn south on Hilltop Road and proceed for 3.6 km. The Notch Hill Cemetery is located on the left hand side of the road. From the Trans-Canada Highway (Highway 1) in Sorrento turn south on Notch Hill Road and proceed for 5.3 km. 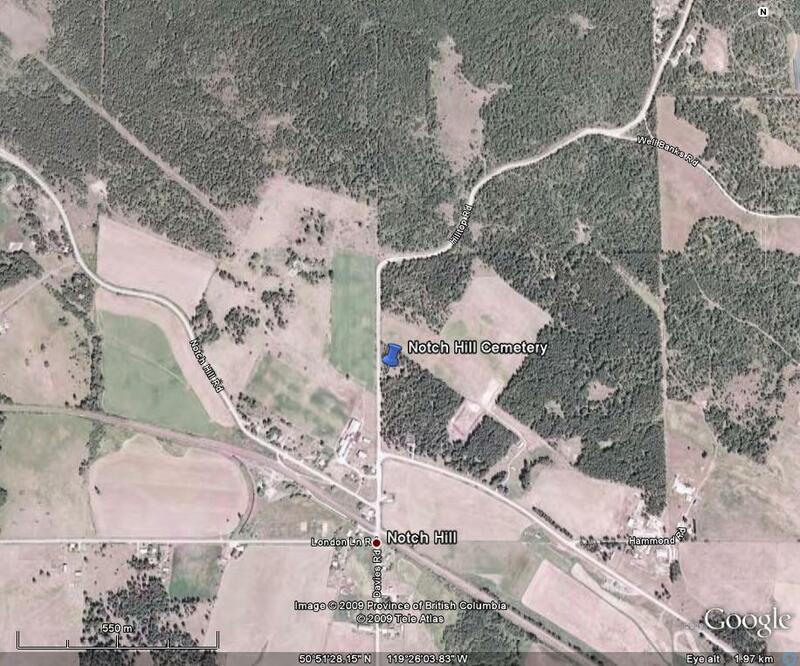 At the intersection of Davies Road and Hilltop Road, turn left onto Hilltop, (gravel road). Travel for approximately 200 metres and the cemetery is located on the right. Travelling from the east from Salmon Arm heading west, at the junction of Balmoral Store (right) and Sprokkets café (left) turn left at the flashing light and follow the old Trans-Canada Highway for approximately 9 km to the intersection of Davies Road and Hilltop Road. Turn right onto Hilltop and the cemetery is approximately 200 meters on the right.